Brant: Do you want another cocktail? Jean: Nah, I'm ok. 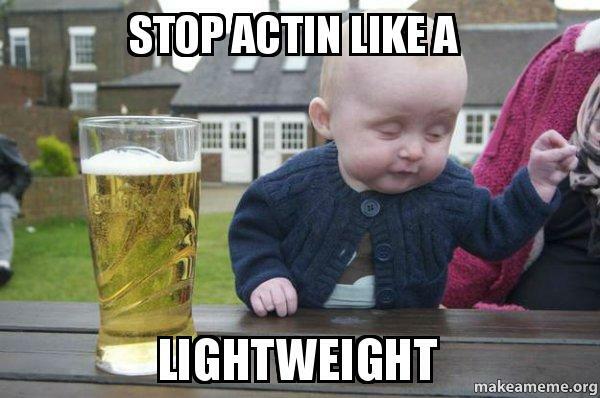 I'm a total lightweight. Brant: But you've only had one? Jean: I know, but if I have another drink, I won't be able to walk out of here. 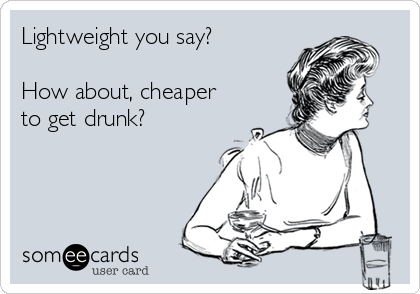 Explanation: "Lightweight" has a number of meanings. Most commonly, it's used for a category of boxers who don't weigh very much. It can also be used to describe a material, such as in a lightweight jacket. Informally, it can also be used to describe someone who can't "hold their liquor," another idiom for a person who gets drunk very easily. Sharon: Hey, Brian. How was the office Christmas party? Brian: Oh, you should have been there! It turns out, Karen is a lightweight. Brian: She got completely wasted and started dancing on the table! I think she was going to start stripping for the boss before someone got her down. Sharon: You're right; I wish I hadn't stayed home. That sounds hilarious!